Salt has gotten a really bad reputation in the past, and now there seems to be a lot of confusion about if salt is healthy or not. It is important to note that the type of salt makes a big difference in whether it is healthy or not. Many of the studies about sodium intake were done with incomplete salts. Table salt, which is 97% Sodium Chloride (NaCl) is chemically produced, bleached and devoid of most other nutrients. It also contains Aluminum in many cases, which has been linked to Alzheimers disease and other problems in the body. This type of salt is not naturally occurring and in fact, when salt-water fish are placed in salt water made with table salt… they die. This type of salt is also devoid of the many trace minerals that the body needs… so it is a wise decision to avoid it. To the degree that table salt is bad, real salt is healthy, necessary and good. While the research linking regular table salt to disease and health disorders is correct, we’ve thrown out the baby with the (salt) water. Consider this: the body contains high concentrations of many minerals and nutrients, and while it needs water, it also must have the proper concentration of these nutrients in bones, blood and organs to function properly. Why Should You Eat More Salt? 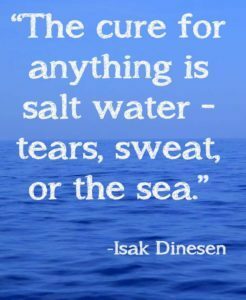 Hydration: I drink Sole (a specially hydrated salt water) every morning for the energy boost, reduction in allergy symptoms and the hydration. Salt (and the other trace minerals present in natural salts) are essential for proper hydration. The type of salt consumed is really important when talking about the health benefits. There is a tremendous difference between Himalayan salt which contains 93 additional trace minerals and regular table salt which is created in a lab and contains two. Himalayan Pink Salt– I use this to make Sole (here’s how to make it) and in cooking. It has a much milder flavor than conventional salt and after using this for a few months, conventional table salt has a bitter taste to me. It comes from ancient salt stores in the Himalayan mountains and we even have lamps made out of this type of salt in our house. Redmond Real Salt– Also from ancient salt beds. Redmond salt has the mildest flavor of all the salt’s I’ve tried and I often use it in cooking dishes where I only want to lightly enhance the flavor but don’t really want the salt taste to come through.